The Queensland Herbarium houses the state’s flora collections, comprising more than 850,000 specimens, and associated data, of mainly Queensland species of plants, fungi and algae. The Queensland Herbarium collections are internationally recognised under Index Herbariorum as BRI. The Queensland Herbarium is a CITES registered institution. Botanists and members of the public contribute thousands of specimens to the herbarium collection each year, representing new species, new naturalisations, and new distribution records of both native and naturalised plant species. The plant specimens are mostly pressed, dried and mounted on archival cardboard. Delicate or small specimens are stored in jars of liquid preservative. Fungi and large woody specimens are stored in boxes or bags. 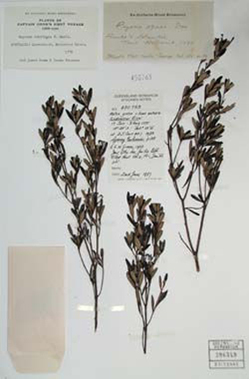 Each specimen is labelled with the collector, date of collection, location and habitat it was found in and the plant’s features, such as bark and flower colour. This information is recorded in a database and is available through Australia’s Virtual Herbarium. Contact us for detailed label information. Find out how to collect specimens (PDF, 3.5MB) to make sure the specimens are collected, preserved and submitted to our requirements. The Queensland Herbarium specimen and library collections may be accessed by bona fide researchers. Requests for access should be addressed to the Director prior to arrival. The facility is located at the Brisbane Botanic Gardens in Toowong and open between the hours of 9.00 am and 5.00 pm on week days. Contact us for more information. Specimen loans may be approved to scientific institutions. Request for loans, including requests for destructive sampling, should be addressed to the Director. Loan conditions and other information will be sent once the request is approved. Donations and exchange specimens are welcome by prior arrangement. Please contact us first to ensure legal and safe transfer of specimens. What is a voucher specimen? Voucher specimens are specimens collected to support a research project or a particular activity, for example they may represent new weed incursions, poisonings, seed collections, ecological research, DNA sequences or biochemical analyses. If you have a requirement to lodge voucher specimens for your research, please contact us before beginning your project to discuss your requirements. Note that cost recovery for processing and storing voucher specimens may be applied. The allocation of Type specimens is an important part of how new species are described. New species are published under international rules that help standardise botanical name use across the world. The Queensland Herbarium houses more than 9000 Type specimens. Images of these specimens are currently available on the JSTOR Global Plants website as part of the Global Plants Initiative. The Queensland Herbarium specimen collections form the basis of our knowledge of the state’s species and plant communities. The specimens and their label data are an essential resource for species identification, management, conservation and legislation. Specimen data can be used to track species’ changing distributions and predict where new populations may yet be found. early Queensland botanists Frederick Manson Bailey, Cyril Tenison White and Leonard Brass. Contact us for information about the history of the Queensland Herbarium.